Blade II is a 2002 American superhero film based on the fictional character Blade from Marvel Comics. It is the sequel of the first film and the second part of the Blade film series, followed by Blade: Trinity. It was written by David S. Goyer, who also wrote the previous film, directed by Guillermo del Toro, and had Wesley Snipes returning as the lead character and producer. The film follows the human-vampire hybrid Blade in his continuing effort to protect humans from vampires, finding himself in a fierce battle against a group of extremely savage, powerful mutant vampires who seek to commit global genocide of both vampire and human races. Blade and his human allies are coerced into joining forces with a special elite group of vampires. It takes place two years after the events of the first film. Blade II was released on March 22, 2002 and was a box office success, grossing over $155 million. It received mixed reviews from critics, earning praise for its performances, atmosphere, direction, and action sequences, although its script and lack of character development have been criticized. In 1999, Two years after the events of the first Blade movie, Blade has been searching in Prague to find his mentor Abraham Whistler, who was thought to have died after being attacked by Deacon Frost and his vampire pack but instead was turned into a vampire. Blade discovers Whistler being held at a vampire safe house inside an amniotic-like tube. After returning to their headquarters, Blade gives Whistler an anti-virus vampire serum to revert him back to human. Blade's new weapons creator, Scud, expresses doubts in Whistler becoming human again. Unbeknownst to Blade, a pandemic known as the "Reaper virus" has spread through the vampire community. Infected vampires are being turned into 'Reapers', a mutation of vampires, immune to all vampire weaknesses with the exception of ultraviolet light, who kill humans and turn any vampires they feed on into more Reapers. Unable to contain the Reapers, Vampire Lord Eli Damaskinos sends two emissaries, Asad and his daughter Nyssa, to seek Blade’s assistance. Damaskinos and his human familiar lawyer Karel Kounen explains that a vampire named Jared Nomak became infected with the Reaper virus and is purposefully feeding on other vampires, resulting in the outbreak of the virus. Damaskinos warns Blade that after Nomak is done feeding on vampires he will begin to feed on humans. Blade reluctantly but cautiously agrees to help. Asad then introduces Blade and his group to The Bloodpack; a group of vampires trained for the sole purpose of killing Blade. In addition to Asad and Nyssa, The Bloodpack consists of Reinhardt, Chupa, Snowman, Verlaine, her lover Lighthammer, and Priest. To keep them in line, and after Reinhardt's racially charged remark, Blade humiliates Reinhardt and plants an explosive charge on the back of Reinhardt's head. On Blade's advice, the team starts by investigating one of the largest nightclubs in the city called the House of Pain, frequented by vampires. They encounter the Reapers and discover their weapons are completely ineffective. Snowman spots and successfully attacks a Reaper, while Priest is ambushed and bitten by another Reaper. Nomak arrives and holds Nyssa hostage. Blade and Nomak fight, revealing Nomak is just as strong as Blade and has the ability to quickly heal from silver nitrate. The fight ends with Nomak gaining the upper hand on Blade but a burst of sunlight reflects off of Blade's sword, burning Nomak. Blade is forced to kill Priest after he becomes infected, Lighthammer is wounded and infected, Whistler deserts his post, and Scud barely survives a Reaper attack by using UV lights to scare them off. Whistler reveals that he followed a Reaper lagging behind and discovered it trapped at a large sewer entrance. The group takes the lone Reaper back to a safe house for further observation. After the Reaper dies from thirst, the dissection of its corpse reveals that most Reapers tend to burn out within twelve hours if they do not feed, as well as having an additional layer of bone, which protects the front of the heart, leaving sides of the heart unprotected but the Reapers are still vulnerable to sunlight. Having learned of this prime weakness, Whistler and Scud create UV projectors for the team. Blade states that their best edge is to search for the Reaper nest in the sewer at dawn, placing the entire Bloodpack at risk. While searching for the nest, Lighthammer succumbs to the infection, killing Snowman and chasing Verlaine up a manhole ladder before both die of light exposure when Verlaine removes the manhole cover. Chupa turns on Whistler and attacks him, only to die when a group of Reapers attracted to his scent tear him apart. Asad is ambushed, dragged underwater, and killed. While attempting to escape Whistler is stopped by Nomak who reveals information about Damaskinos and gives him a royal seal ring. Using a special UV emitter bomb pack, Blade kills all of the Reapers with the exception of Nomak and rescues Reinhardt and Nyssa, but is betrayed by Damaskinos and his people, who stun Blade unconscious. After Damaskinos' betrayal, he reveals that he created The Reaper virus in order to create a new race of vampires based on Blade and that Nomak was simply a failed experiment. Whistler rebuts Damaskino’s lies by throwing the royal seal ring at his feet demanding the full truth. A confused Nyssa picks up the ring and Damaskinos comfirms that Nomak is in fact his son. Scud reveals himself to be a familiar loyal to Damaskinos, who also works with Reinhardt. Blade turns the table on Scud, saying he always knew of Scud's true allegiance, and kills him with the explosive charge he had earlier placed on Reinhardt. Damaskinos then orders his scientists to dissect Blade so they can learn how to replicate his abilities. Nyssa confronts Damaskinos about his lies to her regarding Nomak and the Bloodpack. Damaskinos states that for the survival of the vampire race he is willing to sacrifice everything, including his own family. After escaping his captors, Whistler brings Blade to a blood pool, where he regains enough strength to kill Reinhardt and his men. Nyssa and Damaskinos attempt to escape but Nyssa locks the exit door, preventing either one of them from escaping. Seeking revenge, Nomak tracks Damaskinos to his private heliport and kills him. Nyssa then offers herself to Nomak to be bitten; he infects Nyssa with the virus while drinking her blood. Blade confronts Nomak, and a ferocious battle begins. With his now-broken sword, Blade stabs it through the side of Nomak's chest and into his bone-protected heart, slipping it through the bone plates on the side. Nomak then commits suicide to end his suffering by shoving the sword all the way into his wounded heart. Fulfilling Nyssa's dying wish, Blade takes her outside, where she dies while watching the sun rise before she can fully change. 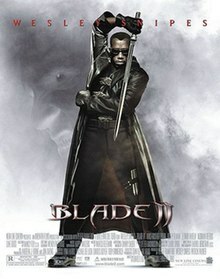 The movie ends with Blade in London, where he kills Rush, a vampire he encountered earlier in the movie. Wesley Snipes as Eric Brooks / Blade: A half-vampire "daywalker" who hunts vampires. Wesley Snipes stated that while such a character is not going to have much emotional depth, he then stated: "there's some acting involved in creating the character and making him believable and palatable." Kris Kristofferson as Abraham Whistler: Blade's human mentor and weaponsmith. Ron Perlman as Reinhardt: A member of the Bloodpack, who bears a particular grudge against Blade. Leonor Varela as Nyssa Damaskinos: An unapologetic, natural-born vampire and daughter to Damaskinos. Norman Reedus as Scud: A young, pot smoking weaponsmith who aids Blade in Whistler's absence. Thomas Kretschmann as Eli Damaskinos: An ancient vampire who is obsessed with creating a superior race of vampires as his legacy. Luke Goss as Jared Nomak: Patient zero and carrier of the Reaper virus. He bears a grudge against his father, Eli Damaskinos for creating him. Matt Schulze as Chupa: A pugnacious member of the Bloodpack who bears a particular grudge against Whistler. Danny John-Jules as Asad: A "well-mannered" member of the Bloodpack. Donnie Yen as Snowman: A mute swordsman and member of the Bloodpack. Karel Roden as Karel Kounen: A "familiar", Damaskinos's human agent and lawyer. Marit Velle Kile as Verlaine: A red-haired member of the Bloodpack and the lover of Lighthammer. The script originally said that she was the twin sister of Racquel from the first movie. Traci Lords was interested in playing the role before it was changed. Daz Crawford as Lighthammer: A hulking, hammer-wielding member of the Bloodpack with Maori facial tattoos. Tony Curran as Priest: A Scottish-accented member of the Bloodpack. Santiago Segura as Rush: A vampire flunky in Prague. Following the success of the original film, New Line and Marvel made plans for a sequel in 1999. It is said that the film was going to introduce Hannibal King and Frank Drake in the series as well as a time travel storyline where Blade goes years in the future. Guillermo del Toro was hired to direct Blade II by New Line production president Michael De Luca after Stephen Norrington turned down the offer to direct the sequel. Goyer and Frankfurt both admired director Guillermo del Toro and believed his dark sensibilities to be ideal for Blade II. Frankfurt first met del Toro when Frankfurt's design company, Imaginary Forces, did the title sequences for Mimic. "I admired Mimic and got to know Guillermo through that film," says Frankfurt. "Both David Goyer and I have been fans of his since Cronos and were enthusiastic about him coming on board. Guillermo is such a visual director and has a very strong sense of how he wants a movie to look. When you sign on with someone like Guillermo you're not going to tell him what the movie should look like, you're going to let him run with it." Like Goyer, del Toro has a passion for comic books. "Guillermo was weaned on comic books, as was I," says Goyer. "I was a huge comic book collector... my brother and I had about twelve thousand comic books that we assembled when we were kids, so I know my background." Tippett Studio provided computer-generated visual effects, including digital doubles of some of the characters, while Steve Johnson and his company XFX were hired to create the prosthetic makeup and animatronic effects. Del Toro chose not to alter the script too much from the ideas created by Goyer and Snipes. "I wanted the movie to have a feeling of both a comic book and Japanese animation," said the director. "I resurrected those sources and viewed them again. I dissected most of the dailies from the first movie; I literally grabbed about four boxes of tapes and one by one saw every single tape from beginning to end until I perfectly understood where the language of the first film came from. I studied the style of the first one and I think Norrington used a tremendous narrative style. His work is very elegant." Stepping back into Blade's shoes was a challenge Wesley Snipes relished. "I love playing this role. It's fun as an actor to test your skills at doing a sequel, to see if you can recreate something that you did," Snipes says. Peter Frankfurt adds, "Wesley is Blade; so much of the character was invented by Wesley and his instincts are so spot on. He takes his fighting, his weapons and attitude very seriously. He's incredibly focused, but he's also very cool and fun." "Wesley knows Blade better than David Goyer, better than me, better than anyone else involved in the franchise," adds del Toro. "He instinctively knows what the character would and wouldn't do, and every time he twists something around, something better would come out." Filming took place in Prague, Czech Republic including the Barrandov Studios, as well as London from March 12, 2001 and concluded July 2, 2001. Blade II was released on March 22, 2002. This was during a period of the year (months March and April) considered to be a bad time for sequels to be released. [dead link] Despite this, the film became the most successful film of the Blade series, making $80 million in the United States and $150 million worldwide. In its opening weekend, the film earned $32,528,016 from 2,707 theaters but dropped 59% of its earnings in its second week, which brought in $13.2 million. The intake is believed to be affected (in part) by the pull of NCAA basketball Final Four games. The film debuted in the United Kingdom at number one, making $3.6 million from 355 theatres and held the spot for the following week, where it had earned $7.9 million, despite a 47% decline. The film was also number one in Singapore, making $214,000 from 30 theatres. Reaction to Blade II among critics has been mixed. The film earned a 57% positive rating on Rotten Tomatoes based on 151 reviews, with an average rating of 5.94/10. The site's consensus reads: "Though Blade II offers more of what worked in the original, its plot and character development appear to have been left on the cutting room floor." On Metacritic it has a score of 52/100 based on reviews from 28 critics, indicating "mixed or average reviews".Audiences polled by CinemaScore gave the film an average grade of "B+" on an A+ to F scale. Roger Ebert gave the film 3½ stars out of 4, stating: "Blade II is a really rather brilliant vomitorium of viscera, a comic book with dreams of becoming a textbook for mad surgeons." James Berardinelli gave the film 2½ stars out of 4, stating: "Blade II is for those undiscriminating movie-goers who want nothing more from a trip to the multiplex than loud, raucous, mindless entertainment." The New Line Platinum Series DVD contains several deleted scene including a flashback sequence showing Blade's first meeting with Whistler, a music video for "Child Of The Wild West" performed by, west coast hip-hop group Cypress Hill and featuring drums and bass performer Roni Size in the DVD Special Features on disc-2, VHS Capture and theatrical trailer. A Blu-ray version was released in 2012. A video game of the same name and based on the movie was released for the PlayStation 2 and Xbox on September 3, 2002. "Child of the Wild West"
Blade II: The Soundtrack is the soundtrack to the film, Blade II. It was released on March 19, 2002 through Immortal Records and Virgin Records, and which featured collaborations between hip hop artists and electronic artists. This was similar to other releases from Immortal Records such as the soundtracks for the films Judgment Night (1993) which featured collaborations between rock and hip hop performers, and on the soundtrack for the film adaptation for Spawn (1997) which featured collaborations between rock and electronic artists. The two singles of "Child of the Wild West" and "Mind What You Say". Allmusic gave it a positive review, praising some collaborations more than others. This soundtrack appeared on four different Billboard charts. Blade II reached No. 26 on the Billboard 200 chart. A sequel, Blade: Trinity was released in 2004. ^ "BLADE II (18)". British Board of Film Classification. March 19, 2002. Retrieved April 29, 2015. ^ a b c "Blade II". Box Office Mojo. Retrieved December 13, 2008. ^ Bill Higgins (April 1, 2002). "A party with a bite". Variety. Retrieved December 13, 2008. ^ Michael Fleming (March 25, 2002). "Helmer scales mountains". Variety. Retrieved December 24, 2018. ^ Ellen Wolff (July 21, 2002). "Artists flaunt character development at confab". Variety. Retrieved December 24, 2018. ^ Variety staff (March 22, 2002). "Weekend Box Office Preview (March 22, 2002)". Variety. Retrieved December 13, 2008. ^ Dave McNary (March 31, 2002). "Col's "Room" at the top". Variety. Retrieved December 13, 2008. ^ Don Groves (April 1, 2002). ""Ice" the rage o'seas". Variety. Retrieved December 13, 2008. ^ Don Groves (April 8, 2002). ""Ice" ages well overseas". Variety. Retrieved December 13, 2008. ^ "Blade 2". Rotten Tomatoes. Retrieved January 6, 2011. ^ "Blade II (2002)". Metacritic. Retrieved December 24, 2018. ^ "CinemaScore". CinemaScore. Archived from the original on July 22, 2018. Retrieved December 25, 2018. ^ "Blade II :: rogerebert.com :: Reviews". Rogerebert.suntimes.com. March 22, 2002. Retrieved January 6, 2011. ^ "Blade II - Reelviews Movie Reviews - James Berardinelli". Reelviews.net. Retrieved January 6, 2011. ^ O'Neal, Sean (August 24, 2016). "The Judgment Night soundtrack foretold the rap-rock apocalypse". The A.V. Club. Retrieved November 1, 2016. ^ Min, Lilian (August 13, 2015). "The Hits and Misses of Marvel Comics Movie Soundtracks". Pitchfork. Retrieved November 1, 2016.